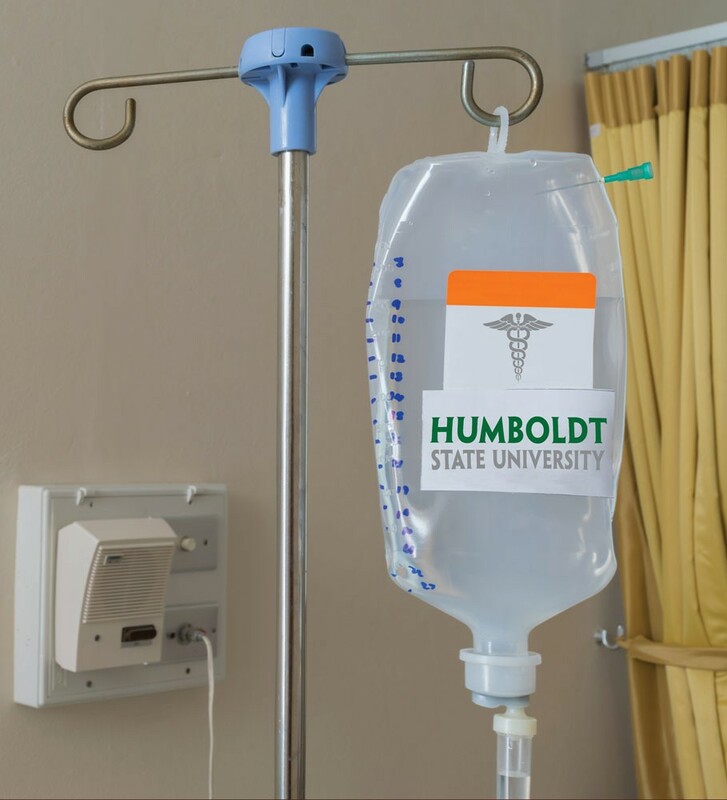 Humboldt State University and College of the Redwoods both confirmed this week that they are busily working toward partnering to offer a program that would allow working nurses to continue their education, a program that would fill a dire need on the North Coast. Efforts to create the new program are still in their infancy and will ultimately need the approval of the California State University system, but the plan appears to be to create a "bridge" program that would allow CR's nursing students to seamlessly continue on to get a Bachelor of Science degree in nursing after receiving their associates degree. It would also give working registered nurses in the community an opportunity to return to school to pursue a bachelor's degree in nursing. As reported in our Jan. 19 cover story, "Nurses, Stat," local officials say a nursing shortage is already impacting Humboldt County and affecting patient care, as hospitals and healthcare organizations are struggling to keep their nursing ranks fully staffed. And the problem appears to be growing worse. According to data from the California Office of Statewide Health Planning and Development (OSHPD), the county had about 1,500 registered nurses back in 2010. By 2014, that number had dipped to 1,451. And in 2015, it came in at 1,401, marking a 7 percent drop over six years. (Data for 2016 is not yet available.) Officials fear the trend will only accelerate without some kind of intervention. According to a 2014 report by the American Nursing Association, 53 percent of the nation's almost 3 million working nurses were over the age of 50 and many believe a national nursing crisis has been simply delayed by the Great Recession, which kept many in the workforce longer than they'd planned and brought others scurrying out of retirement as the stock market tanked. Behind the Redwood Curtain, Humboldt County also faces a unique set of challenges in maintaining an adequate pool of nursing professionals. Those challenges were greatly exacerbated back in 2011, when HSU shuttered its nursing program in the face of an intense budget crunch. This closed a local supply line that had been graduating as many as 60 nurses a year into the local community with Bachelor of Science degrees in nursing. CR still turns out about 55 graduates a year with associates' degrees but the closure of HSU's program cut the supply chain in half and healthcare providers are starting to feel the pinch, having to pay steep prices to bring in traveling nurses for 13-week stints and, in some cases, limit patient intakes in accordance with how many nurses they can staff for a particular shift. This became a recurring and urgent topic of conversation at regular stakeholder meetings of regional healthcare leaders and the office of North Coast state Sen. Mike McGuire. Ultimately, the group determined that a local program allowing working nurses to continue their education locally should be a top priority and pledged to support it, bringing HSU and CR to the table to discuss possibilities. The current vision for the program is that it would accommodate up to 30 students and streamline curriculum between CR and HSU, ensuring CR students would graduate with all the prerequisite work needed to enter the BSN program. Officials hope this will have a two-fold impact. First, the program would result in a higher educated nursing workforce locally and the consensus is that's a good thing. There are two primary routes to becoming a registered nurse in the United States: a three-year associates degree obtained through a community college and a four-year baccalaureate degree (BSN) through a university. Graduates of both programs take the same licensing exam to enter the workforce as a registered nurse. The healthcare world is gradually demanding that more and more nurses get a BSN, which opens doors for advanced degrees and leadership roles. Statewide, about 10 percent of employers require a BSN and 70 percent prefer one, fueled by studies that indicate hospitals with higher educated nursing staffs tend to have better patient outcomes — judged by everything from infection rates to patient mortality. In fact, back in 2010, the Institute of Medicine released a landmark report calling for 80 percent of the nation's nursing workforce to hold a BSN by 2020. "Nursing is becoming more and more complex, and many organizations are recommending or requiring a BSN," explained Hospice of Humboldt Executive Director Joe Rogers in a statement, adding that he's "ecstatic" to see HSU and CR exploring this new bridge program. The second hope underlying the program is that providing working nurses with more opportunity locally will help keep them here, reducing the workforce leakage caused by nurses leaving the county to continue their educations elsewhere. But it seems clear the program — at least as it's being discussed now — is not a silver bullet that will leave the local healthcare system with all the nurses it needs, as it essentially won't change the flow of nurses into the local workforce. Meanwhile, according to estimates from the California Employment Development Department, the North Coast will need an additional 48 registered nurses a year for the next decade. It's worth noting that CR's program is impacted with long wait lists for students to enroll, indicating there is far more demand for nursing education than is currently being supplied. The program currently under discussion does not seem poised to address this unless it somehow increases enrollment to CR's existing program. And most concede a full scale re-launch of HSU's old BSN program is very unlikely and, possibly, even impractical. The program was expensive — to the tune of about $900,000 annually — and HSU is again in the midst of a budget crunch. Perhaps more problematic, the old nursing program was internally dysfunctional and had a very difficult time recruiting and retaining faculty in what's become an increasingly competitive national environment. The new program under consideration would be substantially cheaper because it wouldn't require HSU faculty to do all the in-the-field supervision mandated for nursing students. And the program would be smaller, necessitating fewer instructors overall. But there still seems to be some consternation over funding. University officials have reportedly stressed throughout the stakeholder meetings that any new program would need ongoing financial support — a notion underscored in a statement released by HSU President Lisa Rossbacher. "We are pleased to be working with CR to create a possible RN-to-BSN option locally," she said. "Our regional healthcare leaders have emphasized the importance of finding local solutions to our nursing shortage. To address this, ongoing support from the community will be needed." Thadeus Greenson is news editor at the Journal. Reach him at 442-1400, extension 321, or thad@northcoast journal.com. Follow him on Twitter @ThadeusGreenson.